Synthesis of conducting poly(3,4-ethylenedioxythiophene), PEDOT, is achieved through an original reduction-polymerization route: γ-radiolysis of aqueous solutions containing EDOT monomers under N2 atmosphere. According to UV-Vis absorption spectrophotometry and ATR-FTIR spectroscopy, reduction of EDOT is initiated by hydrated electrons produced by water radiolysis and leads to PEDOT polymers through coupling reactions. The morphology of PEDOT is characterized by Cryo- TEM microscopy in aqueous solution and by SEM after deposition. 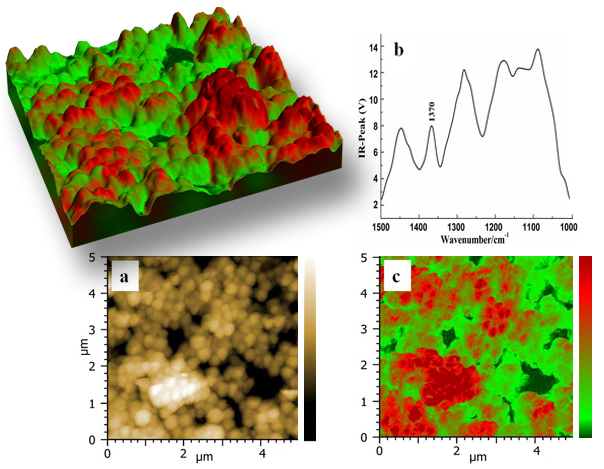 In an original way, high resolution AFM microscopy, coupled with infrared nanospectroscopy, is used to probe the local chemical composition of PEDOT nanostructures. The results demonstrate that spherical self-assembled PEDOT nanostructures are formed. TGA analysis and four point probe measurements demonstrate that thermal stability and electrical conductivity of PEDOT polymers obtained by the present original reduction-polymerization method are close to those of PEDOT we previously prepared by radiolysis according to an oxidation-polymerization route. AFM-IR characterization of PEDOT polymers synthesized according to reductionpolymerization (a) AFM topographic image of PEDOTred polymers in contact mode, (b) AFM-IR spectrum of PEDOTred polymers and (c) AFM-IR chemical mapping of PEDOTred polymers with the IR source tuned to the C-C band at 1370 cm-1. Samples containing 10 mM in EDOT were irradiated at 72 kGy under N2 in the presence of isopropanol, then deposited onto ZnSe prism after lyophilisation.